The morning of Jan. 21, 2017 I awoke to the pouring rain. My plans, however, to attend the Women’s March in San Francisco did not waver. I was devastated by the results of the 2016 election. I felt betrayed and alone. I could not believe that the country I had grown up in, the place I called my home, would democratically elect a person as narcissistic as Donald Trump to be its leader. I went to the San Francisco Women’s March in an attempt channel my anger positively. I needed a forum for my voice. What I found was much more than that. As I emerged from the Civic Center/UN Plaza BART station, I realized that I was a part of something much bigger than my own anger. The platform was so crowded that it took me almost 30 minutes to climb the stairs out of the station. 100,000 people crowded into the area surrounding City Hall. Signs that read “Love trumps hate” and “None of us are free until all of us are free” covered up the cloudy sky. There was an fervent energy running through the crowd — a feeling that we were doing something. We were fighting back. Despite the rain, generations came together to fight against misogyny, xenophobia, homophobia and other forms of hate. This was a march for justice. Our purpose was to prove to Trump, in his first day in the White House, that we did not support him. Together we yelled, we sang, we danced, and we marched. We were powerful; our solidarity and support of each other trumped the hate that the incoming administration espoused. We were a force to be reckoned with. Almost three million people protested Trump’s inauguration worldwide; 673 marches took place, representing 32 different countries and all 50 states of the U.S. I felt more powerful and hopeful in those moments than I thought possible at that time. On the morning of Jan. 20, 2018, I awoke to beautiful weather. It was a perfect opportunity to return to the streets of San Francisco. 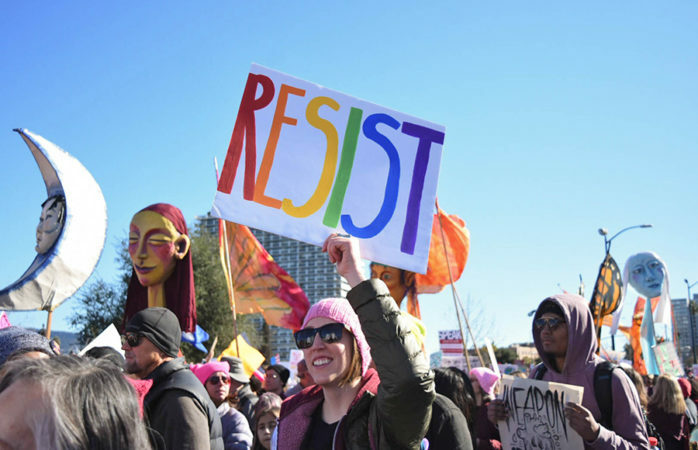 Only months after the #MeToo movement picked up steam, and weeks after Trump’s comments that African countries, El Salvador and Haiti are “shithole countries,” it seemed like an appropriate time for the second annual Women’s March. I was aware that there would be a second Women’s March but I also assumed that after a year of the Trump administration, many had become numb to his hate-filled rhetoric and very few people would attend. I was not willing, however, to let my hope be decimated by the state of my country’s government. Thousands gather near Civic Center Plaza during the Women’s March in San Francisco. I would not let Trump deter me from practicing my power to protest. Nor was I marching to “celebrate the historic milestones and unprecedented economic success and wealth creation that has taken place over the last 12 months,” as Trump said in a tweet Jan. 20. I along with most of those who marched do not believe that any actions of the Trump administration have been a cause for celebration. The Tax Cuts and Jobs Act will raise tax rates on middle- and lower-class families and sees graduate student tuition exemptions as taxable income, destroying many opportunities for higher education; Trump ended the Deferred Action for Childhood Arrivals program, or DACA, terminating the legal protection of about 800,000 “dreamers”; and he continues an egocentric Twitter stand-off with North Korea and its nuclear weapons. So, I marched through San Francisco a second time. This march was different — the energy was different. This year, there were 65,000 people whom I marched alongside. Together we yelled, sang and chanted, but our goal had changed. Presenting a unified opposition to the Trump administration was not our singular purpose. The collective agenda of the second Women’s March was #PowerToThePolls. This march was meant to channel the power of activism present in the first march into real strategies for wins in 2018. The second Women’s March launched a national voter registration tour, a movement with the aim of registering new voters in swing states. By doing so, this tour hopes to lead to the election of more women and progressive candidates, specifically in the 2018 midterm elections. The march was intended to reveal to the younger generation of voters — of which I belong to — that our vote is powerful. There was hope in a different sense than there was the year before. Unlike last year, we do not have to wait to change the course of our government. In 2017, the United States saw the Women’s Convention in Detroit, where over 5,000 activist and leaders gathered, the election of the first openly transgender woman of color to public office and the first Sikh American elected mayor in New Jersey. We are beginning to gain traction. Our activism in the Women’s March is directly translating into electoral power. Our voices are being heard and are making a difference.